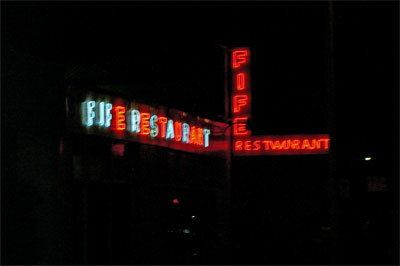 A fuzzier image of a neon sign than normal, however it still let’s you know whose sign it is. Fife’s seems to be one of those places that would almost be too comfortable to ever leave. It’s located in Birmingham’s Central City neighborhood, near the city’s main post office on 24th Street North and 4th Avenue North. Here’s a link to a page about the restaurant on the Yahoo site. This is a time of year when signs that have not been on all summer will awaken from their slumber. Or at least so we hope. Don’t forget about the rest of the series. Enjoy the day. Hey...thanks for stopping by my blog the other day! There's nothing wrong with some cool, funkadelic pictures every now and then...A bit "Warm and Fuzzy" helps make the city!